We offer free consultations and free diagnostic testing for your student. Get in touch today and start planning your education path early! Most standardized test prep programs are one-size-fits-all. Their classes are large and often scheduled too close to SAT, ACT or AP test dates for students to prepare well. But C2 Education conducts 3:1 tutoring. Only three students work with any tutor at once, and classes run long enough to truly prepare students for each test. Our SAT tutoring program uses small classes and a personalized approach. We draw from the very best techniques to fit your student’s strengths, weaknesses, and learning style. Our lessons draw from a wide variety of tutoring resources and a wealth of tutoring knowledge in order to provide a tailored learning experience that does not bore students with topics they have already learned or go through new topics too quickly. The most effective ACT tutoring programs utilize a targeted and personalized approach. Every student has different strengths, weaknesses, and personal characteristics. C2 Education’s tutors are trained to tailor their instruction to each student’s specific needs. They work to build a strong rapport with their students in order to help students prepare both academically and mentally for the upcoming test. C2’s devotion and commitment to each student’s success does not end with academic tutoring. 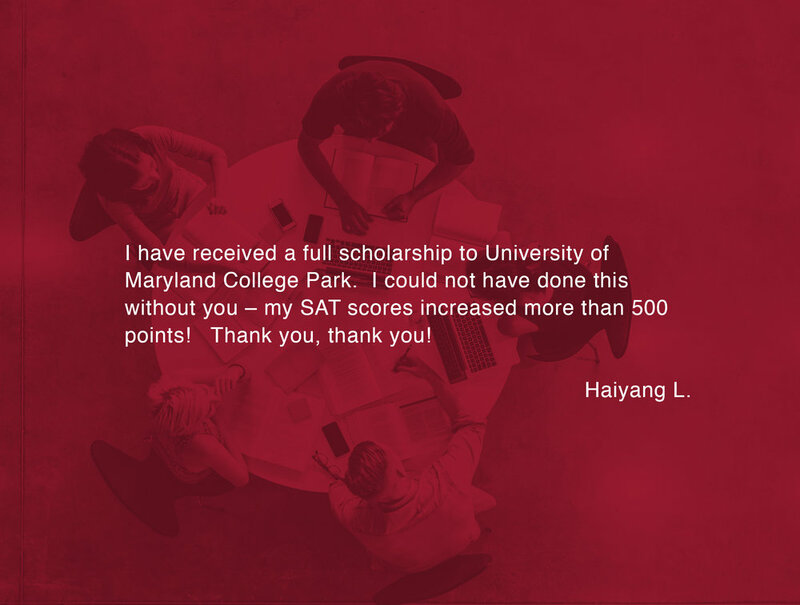 In addition to helping students achieve great grades and excellent SAT scores, we also help them prepare for college, beginning as early as freshman year in high school and throughout the college application process. Our tutors work to make sure that our students are on track as they progress through high school with C2. There's nothing one-size-fits-all about C2 Education. We are mentors who customize our programs to each student's needs, and the skills we teach prepare them for outstanding achievements — not just in high school and college, but for the rest of their lives. 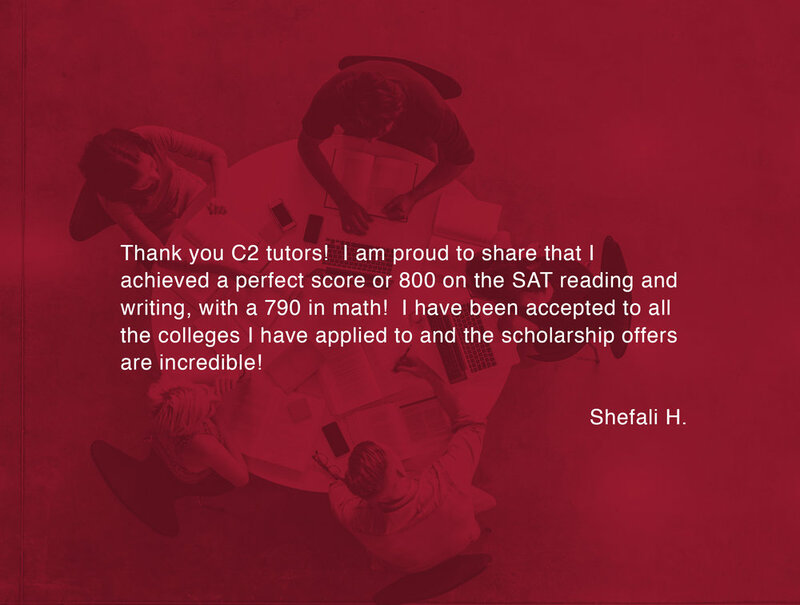 Whether students need tutoring or test preparation, a little academic boost or a blast-off toward the college of their dreams, C2 helps them conquer their goals. Reading is to the mind what exercise is to the body. The only problem is, if a student doesn’t master reading and gain the proper level of confidence early on, it can become a lifelong chore and something to be avoided. At C2, we work with our students at all levels to improve and broaden their reading skills. Galileo once wrote that the secrets of the universe are written in the language of mathematics. At C2, we think anyone who finds math dull, tedious, or too difficult, hasn’t found the right teacher. Having a strong foundation in math is critical for higher learning in any field, not to mention excelling after graduation. Good writing is all about telling a story well, and telling it in a way that not only informs the reader, but compels them to action. At C2 we know there’s only one way to become a good writer, and that’s to write. We work with our students to help them build their confidence and find their own literary voice.